Today was my aunt's birthday and honestly, what better way to celebrate than with Jello shots? I was spending time with my love, Pinterest, when I came across a recipe for lemon slice jello shots. I was intrigued and it seemed really simple. While the recipe was for lemonade flavored Jello, I decided to make my own flavor combos. The green ones are margarita flavored (lime Jello, triple sec and tequila), the yellow ones are piña colada (pineapple Jello and Malibu rum) and the red ones are raspberry, triple sec and vodka. While all of these were delicious, the piña colada flavor was a hit! This was so simple to do, I may make this for any future get togethers. It definitely beats using the little plastic shot glasses. I mean, doesn't it look classy? If I had to change something, it would be to use lemons instead of limes. The lemon have a thicker rind, making them sturdier to scoop out. And by pure coincidence, my nails matched the shots. I found a Brazilian polish that I hadn't used in a REALLY long time, Risqué Creamy Nail Polish in Rebu. Now, I don't know who decided to nail this creamy because it's not. This is a straight up sheer red jelly, very similar to the Zoya Gloss collection (which I NEEEEEEED). The first coat went on a bit patchy, but not awful. 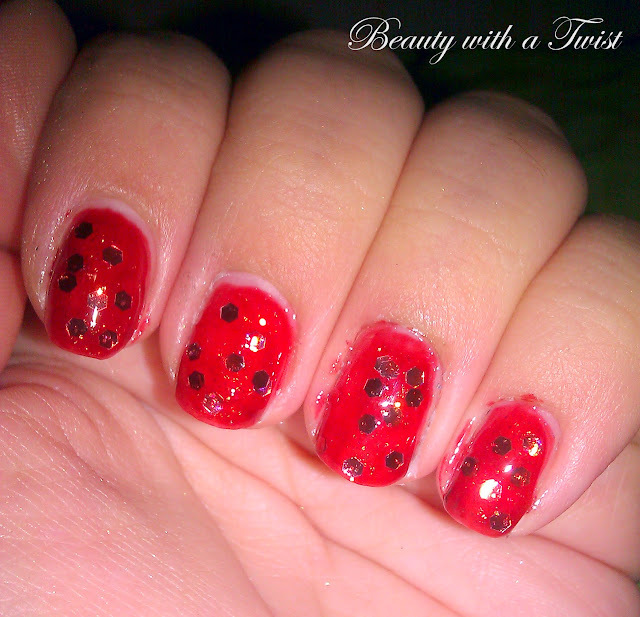 I didn't want to use coat after coat so I decided to layer Love My Nails "Crystal", a silver hex and micro glitter. Once that was dry, I followed up with another coat of Rebu and some top coat. Here is a shot with flash so you can see how pretty this color is. 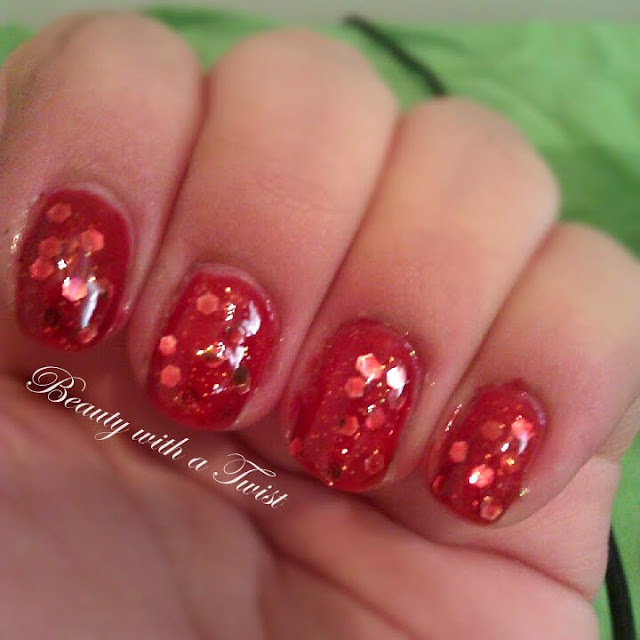 I will definitely revisit this combo in the future, I love how the polish tints the silver glitter. Also it looks like CANDY, what more could I want? If you want more info on the Jello shots, let me know in the comments. those jelly shots looks so good! Thank you! The jello went so fast, haha. I love the pineapple shots as well, but there are so many combos I want to play around with! You should try to make them, it's pretty easy. oh my goodness, how i wish we were neighbors! lol they look and sound so yummy and love that they aren't done in the traditional little cups! your nails look amazing, i love the color! Thank you so much, if you're ever in NYC, stop by! 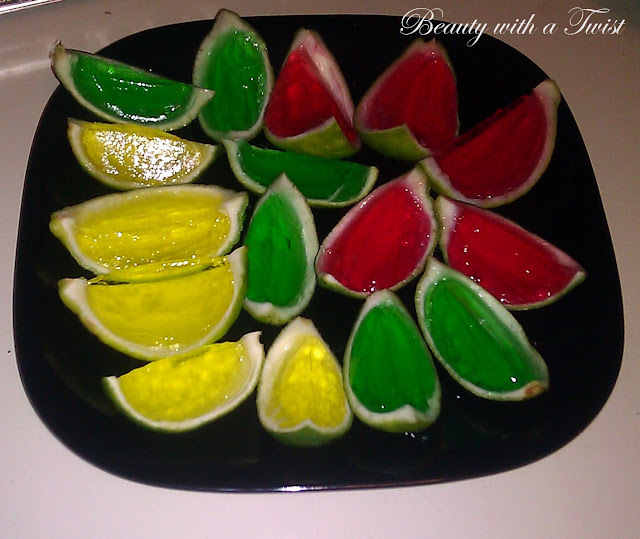 Your jello shots look so delicious shaped as wedges! Thank you, it also made clean much easier without cups all over the place. I love this polish as well, I've had it for a really long time. I never in a million years thought you could dress up a humble Jello shot. Nice work. The jello shots look awesome! Thank you, Elisheba, they tasted just as good. Those jello shots look amazing! Must try those! I hate the tiny cups...sometimes they're too stiff to squeeze the jello out...and I definitely don't want to eat it with a spoon lol. Please let me know if you try it, it's easy. I decided to try this method because I was too lazy to buy the cups, haha. 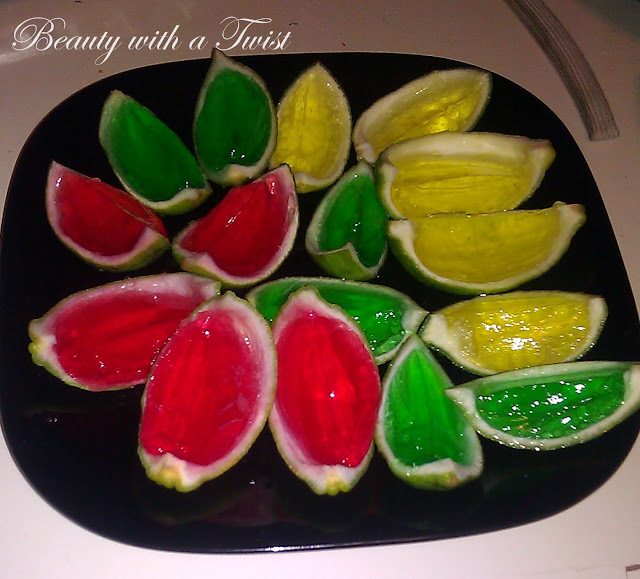 I like the jello shots - they look really good especially since I am not a fan of jello. But adding something extra to them always helps me to enjoy them more! Thanks Mia, I really liked playing around with flavor combinations, instead of just jello and vodka. Thanks, Sherine, I'm glad I held onto this bottle.